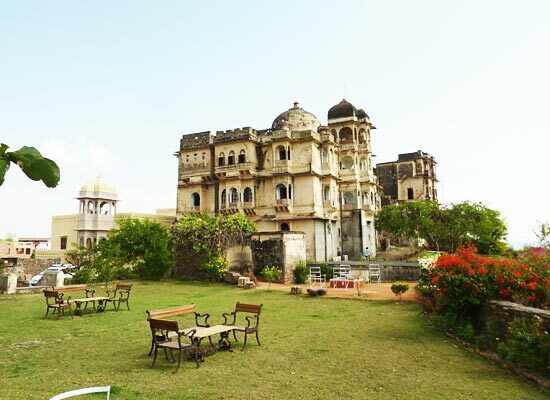 "Towering above the sparkling River Chambal, places on steep ridge around 200 feet high is Bhainsrorgarh Fort, known for its splendor and breathtaking location. One of the most popular heritage hotels of Kota, this fort hotel is known for offering impeccable hospitality and a royal treatment to its guests. Opened for the guests in the year 2006, this Bhainsrorgarh Fort heritage hotel has pristine atmosphere, a regal feel and serves best gourmet meals in its dining rooms and at alfresco dining area. This hotel has been awarded Best Heritage Hotel in India by Tatler Travel Guide, UK in 2008 and 2009. Located 50 km southwards of Kota, Bhainsrorgarh fort was constructed in the year 1742 by Rawat Lal Singh, 2nd son of Rawat Kesri Singh of Salumber. Bhainsrorgarh was a jagir (fiefdom) that was granted by Maharana Jagat Singh II of Mewar in 1741 A.D.
No 2 rooms here at identical to each other. 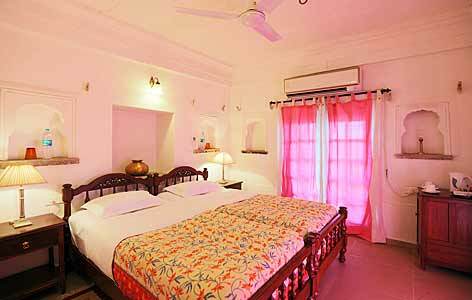 Bhainsrorgarh fort hotel has a total 5 Suites and 4 Deluxe rooms. The guest rooms are located on 3 floors around a courtyard. Each room exudes royalty. 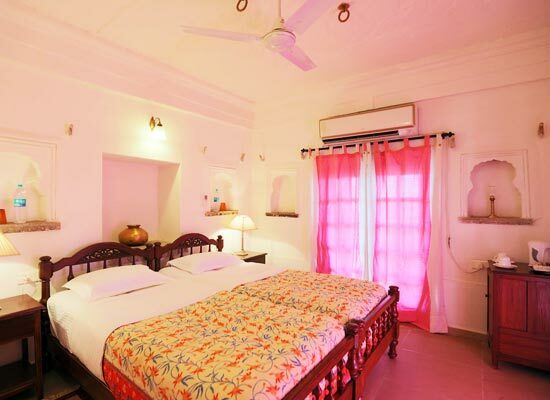 The fort’s largest suite is Mewar Suite is just an ideal place with a lounge area, specially designed for the same. Bhainsrorgarh Suite and Fateh Vilas Suite have spacious balcony where you can sit and enjoy the views of the river. Old photographs and trophies adorn the walls of the lobby area facing the inner courtyard, common to Chundaji Suite and Fateh Vilas Suite. From the deluxe rooms, enjoy the lovely views of the village. Named after a popular poet and father of the present owner Rawat Shiv Charan Singhji, Late Rawat Himmat Singhji, Himmat Vilas Suite comprises of a private balcony and terrace. The suite overlooks the garden of the hotel and offer the view of the Chambal River. Chunda ji Suite and Maharana Fateh Singh Suite (Fateh Vilas) are the 2 suites on the first floor. While the former one has the garden on one side and river on the other, the latter one comes with a private balcony with a view of the River. 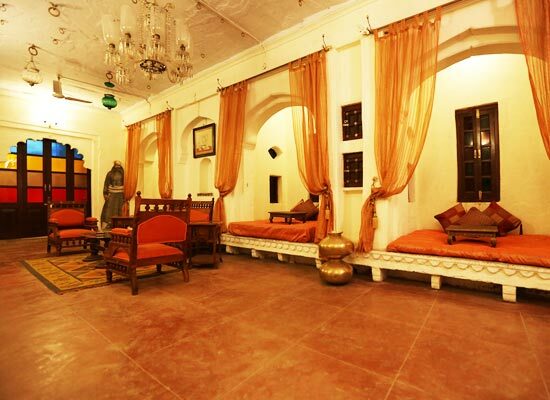 On the second floor are Bhainsrorgarh Suite and Mewar Suite. 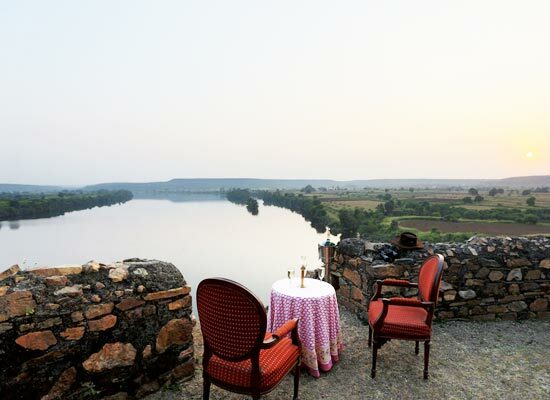 Overlooking the River Chambal, Bhainsrorgarh Suite comes with a huge balcony. And, the hotel’s largest Suite- Mewar Suite consists of 2 small balconies with views of the river and the hotel’s garden. 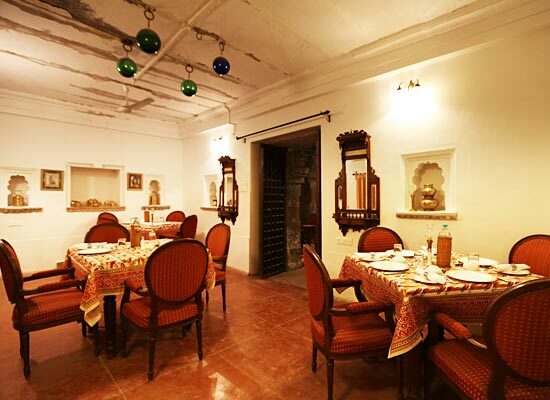 At Hotel Bhainsrorgarh, there are 2 dining venues- the dining rooms and the alfresco dining area. The food served here comprises of delicacies from the royal kitchen. Signature Bhainsrorgarh dishes running in the family from generations are used in the kitchen. The ladies of the house personally supervise the meals that are prepared. The menu includes both vegetarian and non-vegetarian dishes, biryanis, pulaos, kebabs and a special dessert, called Dadariya. The vegetables, spices, meat and grains are fresh and excellent quality, specially grown in the fort’s own organic garden. Bhainsrorgarh is sleepy town. It is quite close to places like Bundi, Kota, Rawatbhata, Ranthambore and Chittorgarh.